Owned by Swedish company Betsson AB and incorporated in Malta, the BML Group Ltd is one of the most reputed providers of online gaming entertainment - from sports betting and casino games, through bingo and scratch cards, and of course, poker. BML Group notably owns the popular brands Betsson, Betsafe, NordicBet, and Triobet and operates in connection with the Microgaming and Ongame networks. On betsson.com, you will find two poker rooms connected to two different worldwide networks with millions of registered users from all over the world: Microgaming and Ongame. Both offer a variety of bonuses and special promotions. Besides a choice of different welcome bonuses, new players are invited to six special weekly €500 freerolls. Players are rewarded with cash prizes and Achievement Badges for completing various achievements tasks, from playing a minimum number of tournaments to getting dealt pocket Aces or winning hands with pocket 8s. Other special features include Blaze Poker and a Bad Beat Jackpot. First depositors can choose from FIVE different welcome bonuses and get up to $2,000! Players are invited to join the weekly and monthly Player Point Races. The top 50 in the special September Rake Races will win a share of $10,000. The Poker Club, with five status levels from Challenger to SuperPro, is part of the loyalty program and gives extra value to regular players in the form of cash, tickets, and other prizes. If you’re a fan of speed poker, you might want to try the fun and fast Coinflip all-in tournament: a Sit & Go with 1 starting chip! 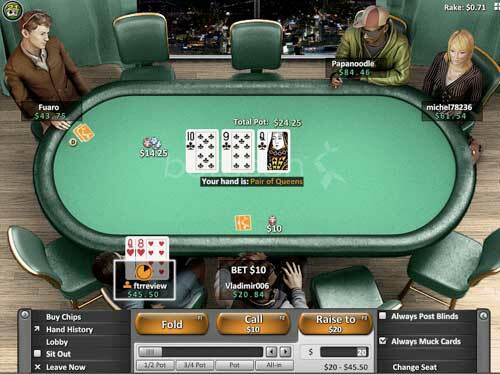 Similarly to Betsson, the site includes two poker rooms, powered by different software - Poker Black is connected to Microgaming and Poker Red - to the Ongame network. Both offer a variety of promotions and bonuses and if you’re a first time depositor, you can choose the welcome package that best suits your playing style and bankroll! The site boasts more than $3.5 million in guaranteed tournaments every month. You will find all the popular Microgaming features such as Blaze Poker or the Bad Beat Jackpot. Try out the Fun View - a recent addition with 3D rendered images and three different background themes. And for a quick adrenaline fix, there is ‘the quickest Sit & Go on earth’ - Coinflip, a ONE HAND, all-in, winner-take-all sit&go. Similarly to NordicBet, while the focus is on sports betting, TrioBet has a fast-growing, Microgaming poker room with a broad choice of welcome bonuses. The loyalty program features four status levels: baby shark, shark, killer whale, fisherman, and rewards players with up to 30% rakeback, as well as additional free bet and free casino spin bonuses.